The United Nations Office on Drugs and Crime’s 2009 Global Report on Trafficking in Persons shows that the most common form of human trafficking is sexual exploitation, which accounts for 79% of the phenomenon. The victims of sexual exploitation are predominantly women and girls. On the occasion of the 32nd edition of the Operaestate Festival in the Vicenza province of Italy, a provocative art installation will try to raise awareness on the issue of human trafficking. 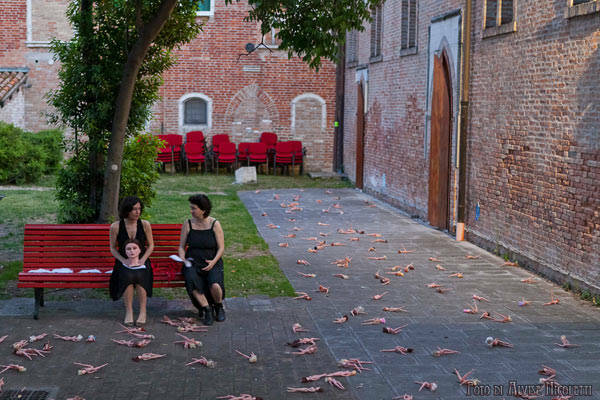 On August 25th in Bassano del Grappa, artists Anna Piratti and Silvia Gribaudi will invite the public to take action against sexual exploitation by scattering 800 naked dolls in Piazza della Libertà. The 800 naked dolls, only dressed of a tag with a bar code on it, symbolize in the intention of the artists the women and girls in the world whom are sold and traded as goods, transported from one country to the other like inanimate objects, deprived of their own will. “We want to express the frailty of the victims of human trafficking and sexual exploitation. So many women and girls in the world are treated just like toys,” explained Anna Piratti to Vicenza Today. The installation will invite the passersby to pick up a doll and take it to another area of the square where containers will hold rags, cloths, pieces of fabric and strings for the audience to fabricate a makeshift dress for it. “We will invite the audience to take care of the dolls, dressing them up to restore their dignity,” Piratti added. Once clothed, the dolls will then have to be returned, but the artists take it into account that some people might actually want to take the dolls away with them at the end of the performance: “We expect that to happen, it will not be a problem,” Piratti concludes.